Although there are some exceptions, campaign signs should only be posted for a limited period from September 9, 2016 through November 8, 2016. Once the general election has concluded, please help us comply with local city ordinances by helping us collect our campaign signs from your area. Notice: It is a violation of Texas law to place any campaign sign in a highway right of way, including the median or shoulder of any public roadway. Campaign signs should not be placed on any public property, including public parks, libraries, government buildings, and courthouses. Campaign signs should also not be placed on any church property or the property of a 501(c)(3) non-profit organization. 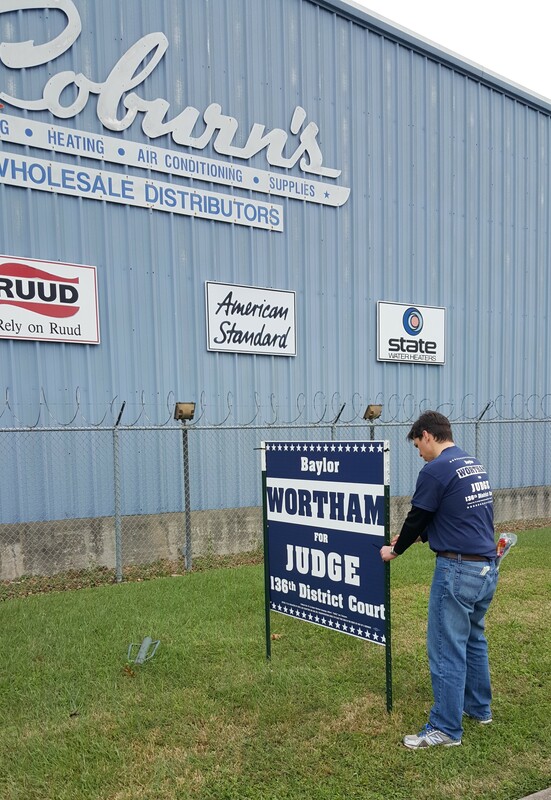 If you would like a large 4×4 campaign sign for your home or business, please send us your address (or provide a description of your property) and contact information to baylorwortham@gmail.com. Please also include any special instructions regarding placement of the sign in your email. 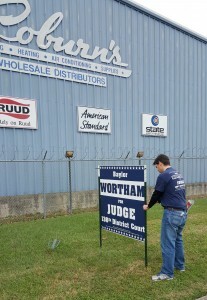 A campaign volunteer will conveniently put the sign up for you on your property and will also promptly take it down at the end of the campaign period. 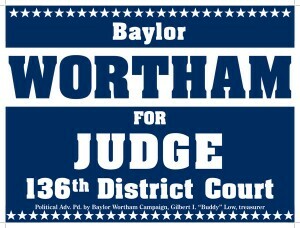 To report any problems, issues, or concerns with a Baylor Wortham campaign sign, please call (409) 782-8180. 3246 U.S. 69 Access Rd.